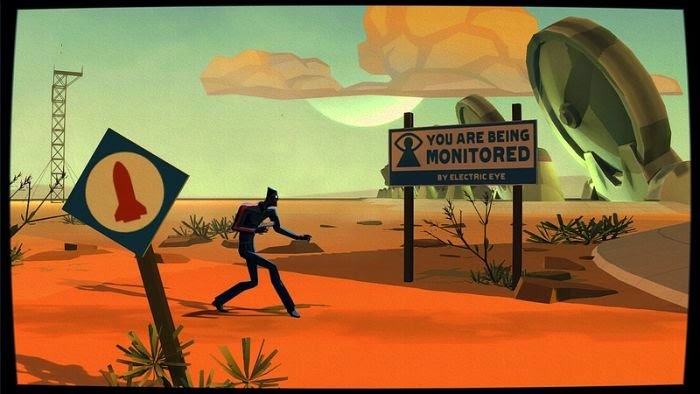 The heads on our 2 Counterspy guys progressed in the same way as the rest of the body part. Using the vector outlines that Aspire generates, gives me the profile for the second layer. 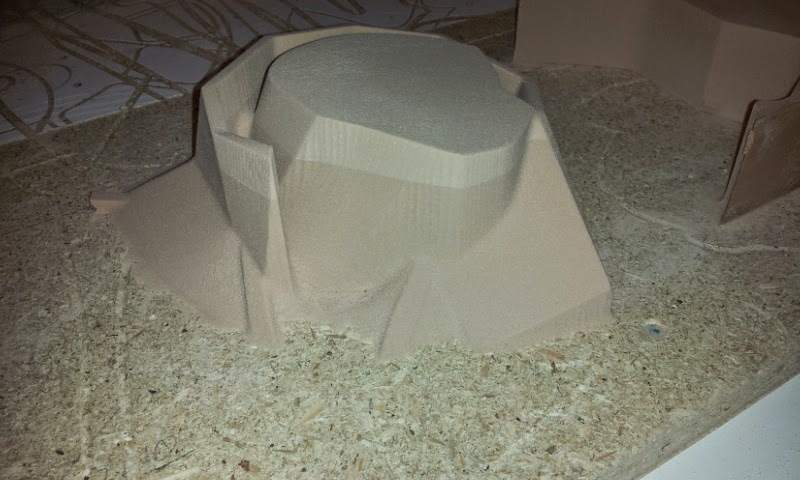 All in all, smart model slicing, and the cnc milling past the glue seams creates a pretty nice model in the end! 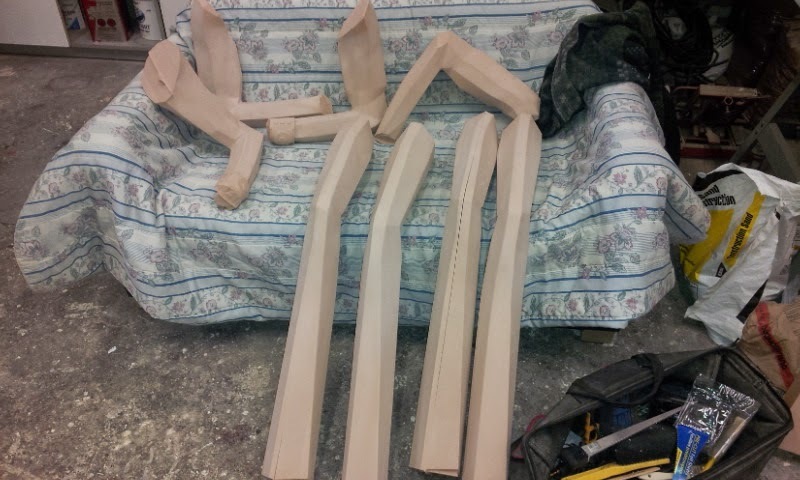 It wasn't long in the end, before we started piling up body parts in the shop! I can tell you, it can be a bit overwhelming with all the pieces lying around, knowing you have to clean and assemble every single piece! After the outside surfaces had been taped together, and the joints between all the left and right halves had been cleaned up, it was time to address the frame inside the spyguy!. I decided early on, that the track for the frame was probably easier to locate after the parts were made, instead off including them in the computer model. Once I had the tracks locations determined, I used a small hand router to mill out the pocket the framework would sit into. 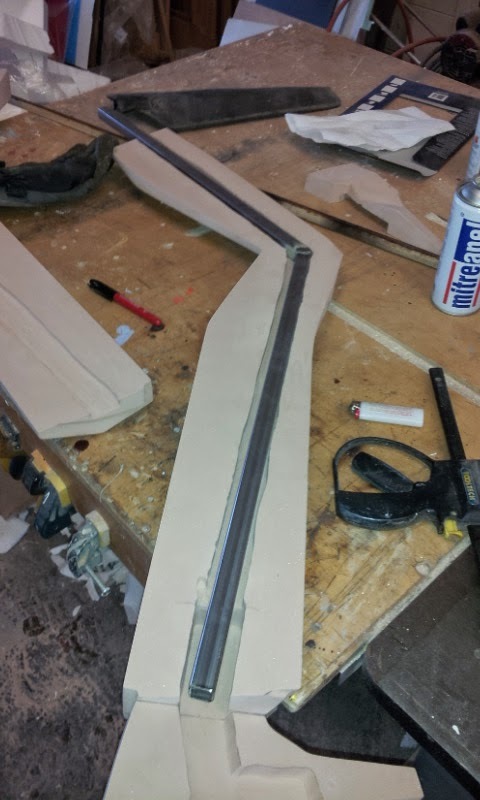 The various angles were a bit tricky to cut from the 1" steel tubing, so it was a bit slower than I would have liked, but in the end, it always gets done! When I said it was a whole day slicing Agent Chevalier, I should clarify. The actual slicing in STL Slicer was only a couple of hours. 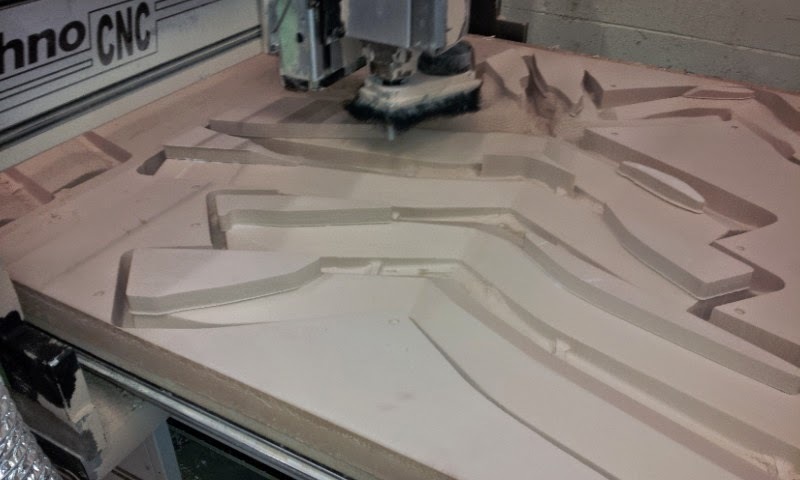 You can orient the pieces in Aspire for further slicing, but as the parts export from STL Slicer in the orientation they were created, it can be a bit of guesswork. A little off here and there, could lead to disastrous results on the final model. 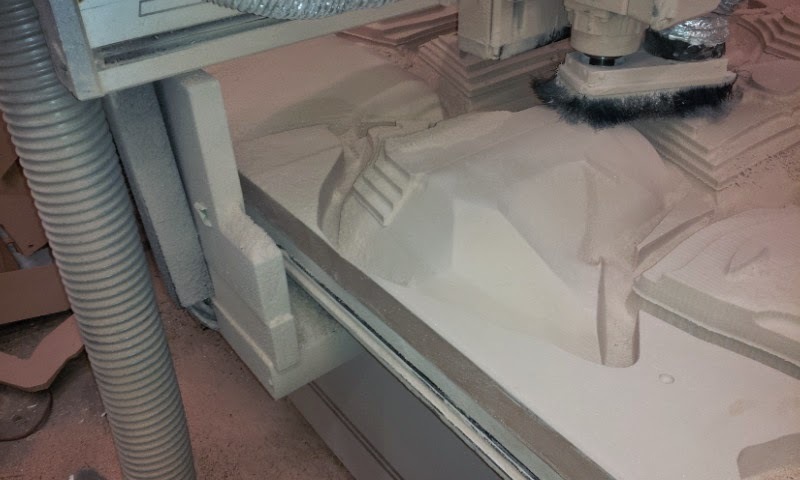 Then it was just a matter of bringing them all into Aspire for layer slicing and machining! 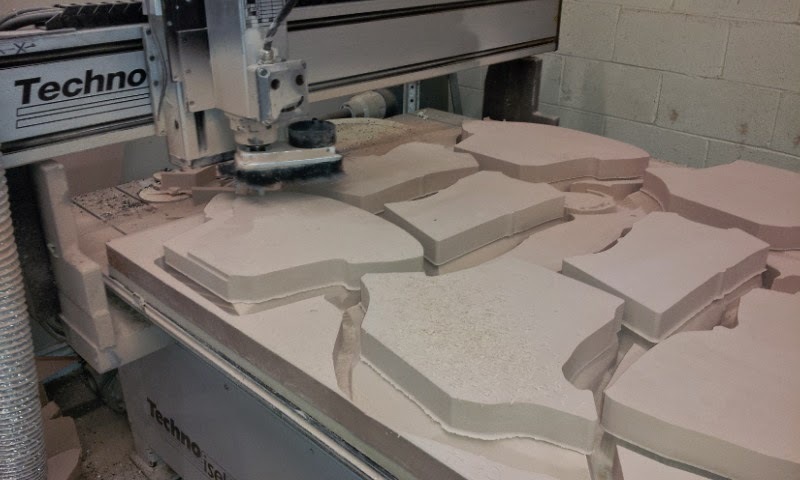 In order to keep the hand finishing to a minimum after cutting, I strategically sectioned off each angle change in the model for toolpathing. This would let the cutter travel in the optimum direction for the final finish toolpaths. 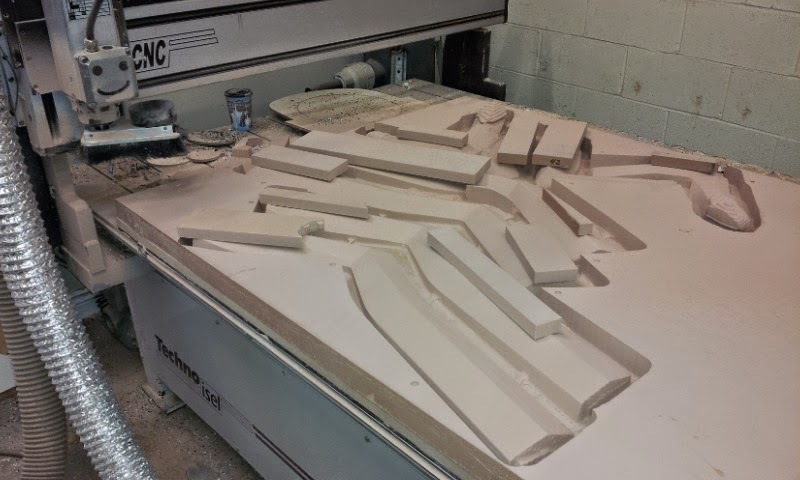 Then I combined all the separate toolpaths into one cut large cut file. 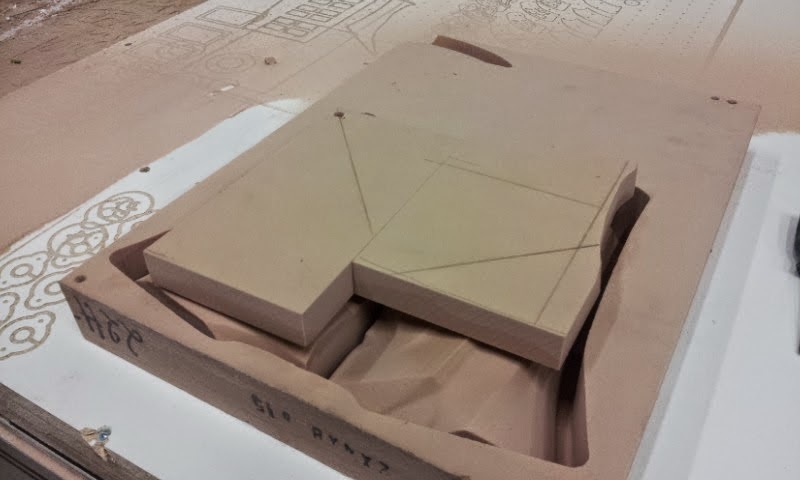 In order to keep the material waste to a minimum, I cut the second layer of the pieces as blocks, then glued them where they were required. 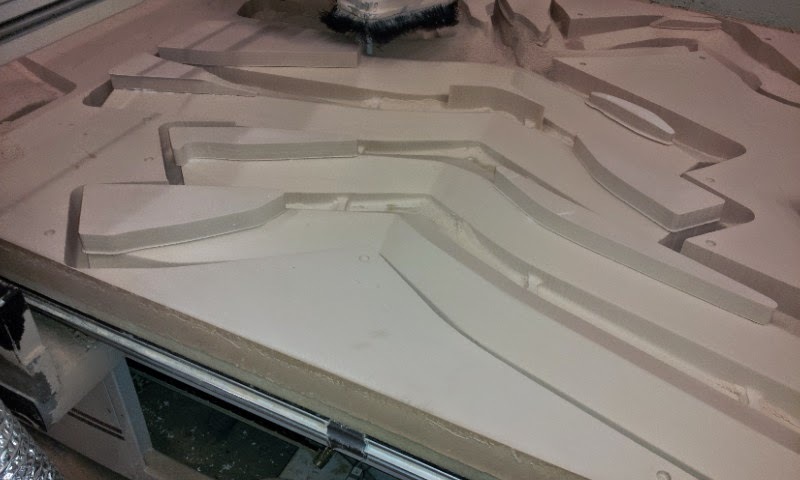 Using our Techno, I cut the blocks to there final profile shape, then ran the second layer 3d toolpaths on just those areas. This kept the waste to a minimum. 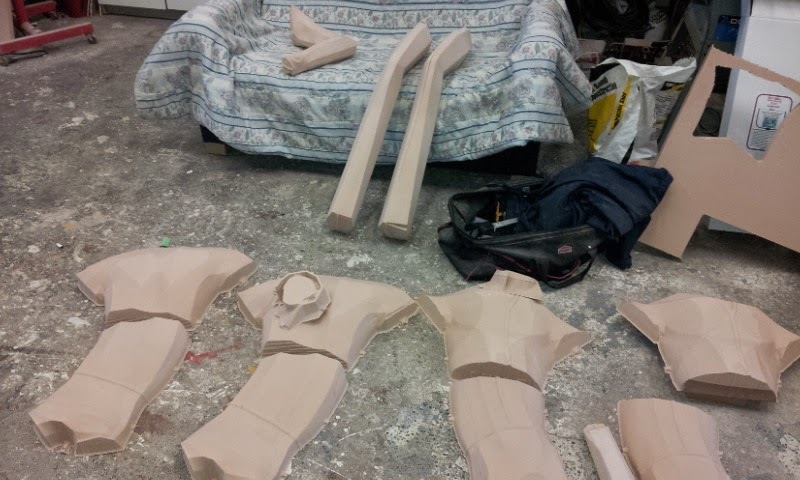 The process was repeated for every piece of spy guy that was thicker than the 2" HDU we were using. It took a total of 10 hours to machine all the parts for 2 guys. This also included running our LC3024 for any of the smaller parts that would fit on it. 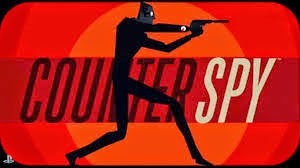 Finally, the Counterspy game from Sony/ Playstation has released! Not that I'm a video gamer at all, it just means that the NDA on that build is over, and I can post about it! Sounds kinda cool to me! We were actually sent a hi-poly 3d model of the main character "Agent Chevalier"
I was totally pumped to build this! I have a love affair with the "low-polygon" style, so this was right up my alley. It was pretty sweet that they supplied the 3d model already in his final pose, saving us the workload of posing the character! One of my other closet passions is finding the right software that can make our lives easier! I spend a great deal of time online, downloading software, running trial versions, blah, blah. All in attempts to find packages that will ultimately serve us for the better. 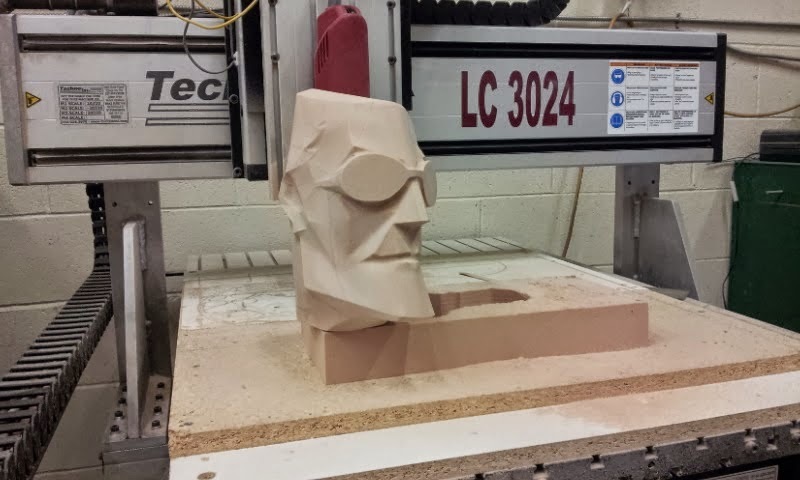 One amazing little gem is "STL Slicer" This originally came as a plug-in for the Carvewright cnc software. But I feel single hand-idly responsible for contacting them, relentlessly, and getting them to release it as a standalone application. Which they did! WOO-HOO! The beauty of this simple application, is that it lets you slice 3d STL files with a cut plane. 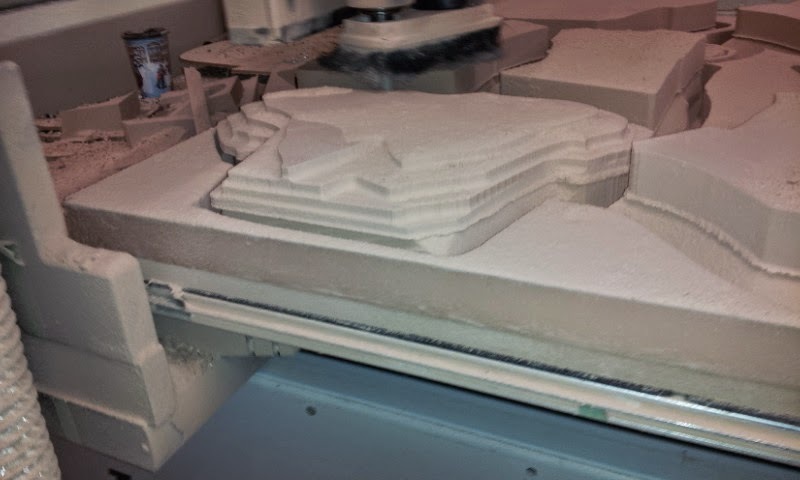 Ultimately making a model like this better suited for 3d CNC machining. The best part of this package is the drag and drop model tree. 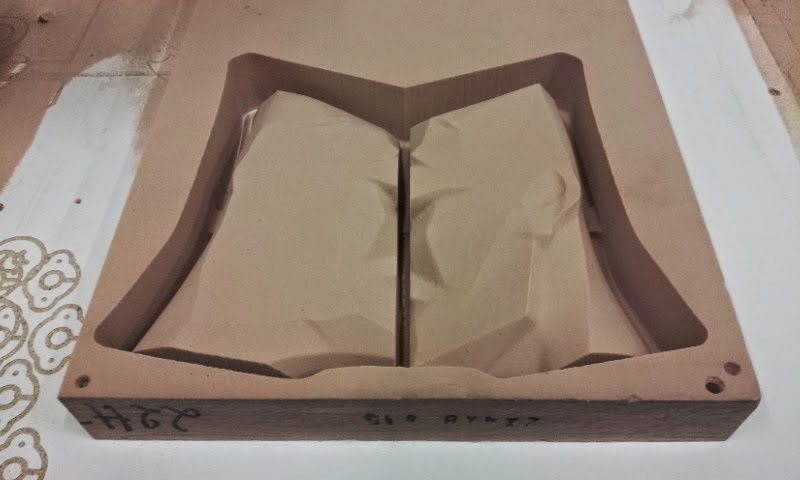 Simply meaning, that if I slice a model incorrectly, I can drag the parts together, and they self-heal, like it was never cut at all! The software is dead simple to use, and the interface isn't crowded with features most people would never use. Another well thought out feature, is that the software will highlight in blue, any surface that becomes an undercut after the slice. This would be based off 90 degrees to the giant green cutplane. They also allow you to adjust this undercut display from 0 to 9 degrees. This is important when using tapered ball nose cutters. I used a straight ballnose cutter for machining, so I just left this setting at 0. I cant stress what a great feature this is, as it let's you decide if you might be better picking a new slice location. However, if you mess it up, you can just drag the pieces together in the model tree, and start over! As great as the software is, it still doesn't do it for you! So this meant a full day of slicing for me. I fancy myself as being a pretty smart cat, but sometimes I would get myself backed into a proverbial corner. Ultimately having to re-think my slicing strategy, to allow the most efficient, and cleanly machined parts at the cnc end. 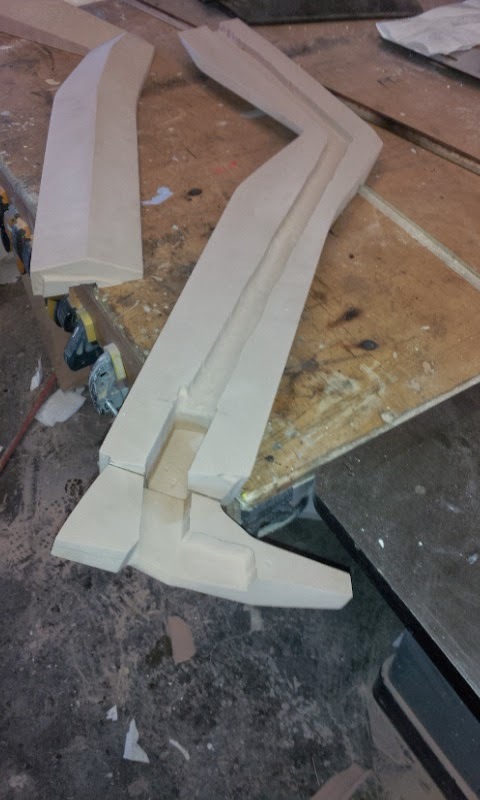 We had to stay true to the geometry, and this means as little hand shaping as possible after the routing! 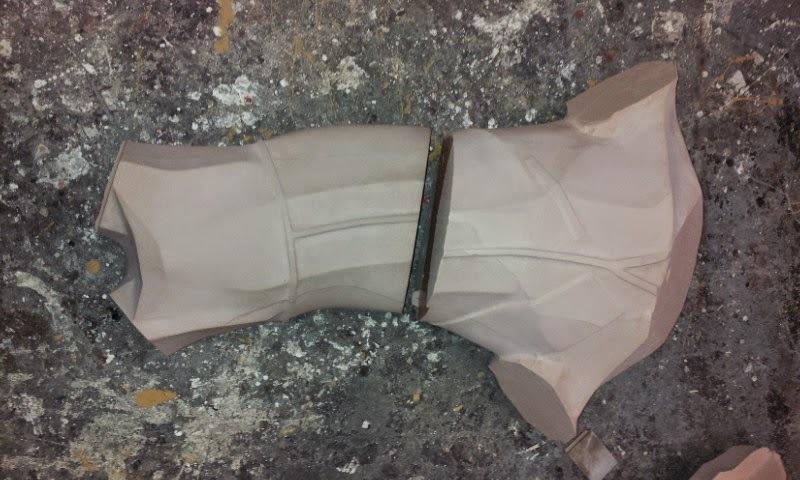 As Sony wanted to see a sample finish of just the head, it was the first part of the model sent to the guillotine! 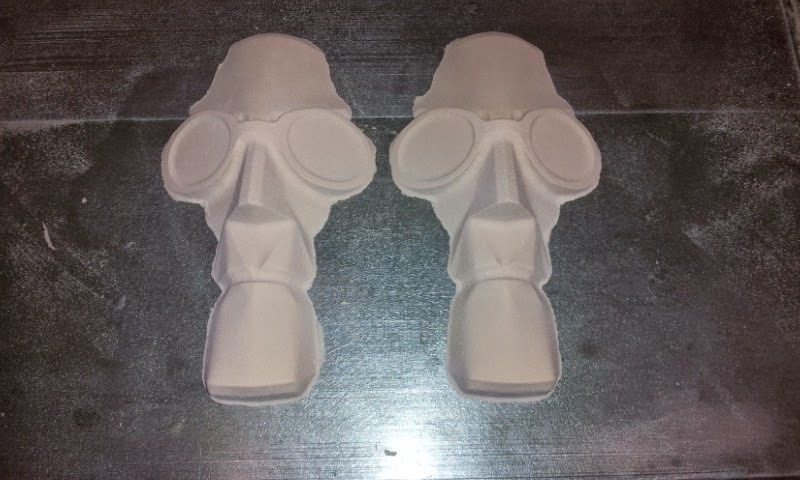 Both the sample and the final head were sliced the same way. 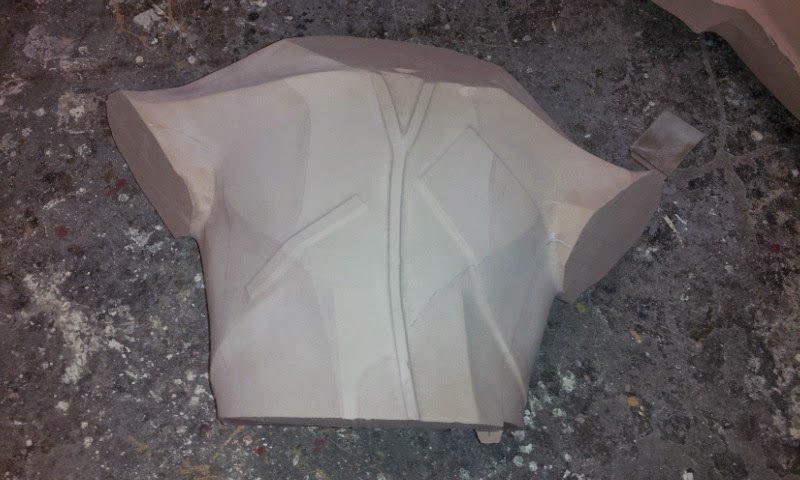 I was able to get the head down to 3 pieces, the face, and two halves. This was the smallest amount of pieces, with next to no undercuts. All said and done, there were 23 final pieces, ready for import into Aspire. 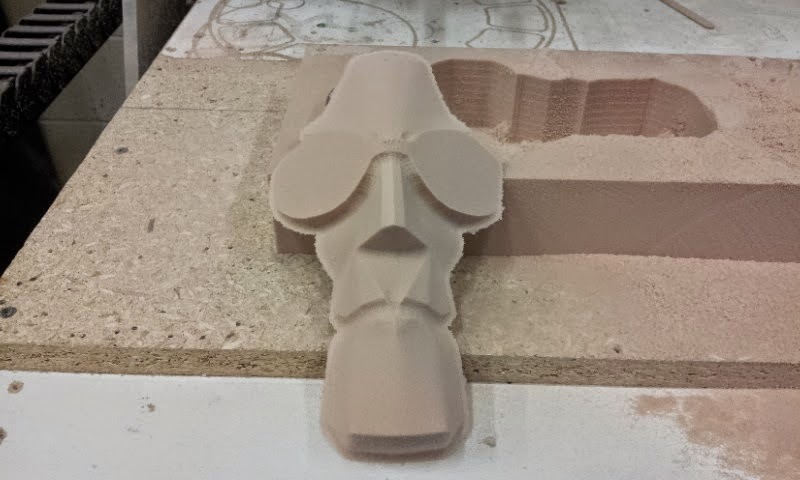 We're making 2 of these guys, so it was actually 46 pieces to machine! Jody and I got to enjoy the Canadian long weekend, which was a lot fun for us. It did make me a little late posting the tombstone final build though! Once our scenic mud had dried (or almost) we spent a bit of time removing some of the texture. As great as I though it looked, it was a little too pitted to pass as a real limestone headstone! I used Aspire and our Techno to V-carve the text portion onto the front side of the stone. This was done with a high spindle speed, and low feed rate. I didn't want the thin coating on the styrofoam to chip out. A little was okay, but too much would have been very bad for this! In the end, it came out as perfect as I was expecting. We used 2 coats of the same color glaze to add a little depth to the otherwise flat finish. The final step was to add 2 gentle passes of speckle paint to all the faces in a very dark grey. It looked really good, and surprised the neighbor when I asked for help lifting it onto the table! All in all, it was a fun 2.5 day build! I'm already drawing up different versions for everyone on my 'list' MU-HA-HA!